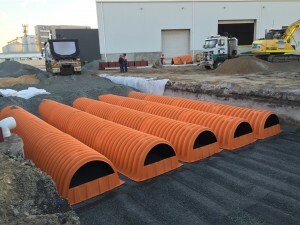 Serling Consulting specified and designed the supporting infrastructure for a Vortechs brand hydrodynamic separator, installed as part of works at the Crown Burswood site in Western Australia. Infrastructure included a weir box upstream of the Vortechs unit to control the top water level of the landscaped lake, even allowing the total draining of the waterbody. The Serling Consulting team designed and oversaw construction of the 20 hectare, 11 lot commercial subdivision in Wangara, Western Australia. 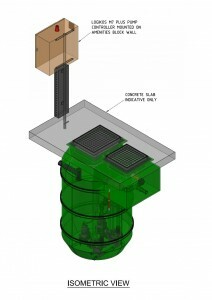 Works included water, sewer, power, communications, roadworks and stormwater drainage. 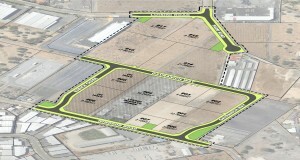 Total construction cost – $4.5 million. In 2015 Serling constructions designed and oversaw construction of the site upgrade works at the Dodd Group Metal Recycling facilities in Forrestfield, Western Australia. Works Included 800m2 of high strength concrete slab as well as a full redesign of the administration building’s carparking and below ground stormwater storage chambers. 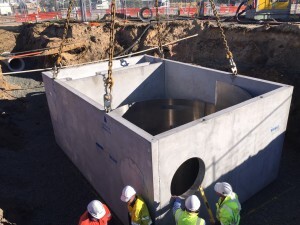 Commissioned by the City of Cockburn, Serling consulting provided design documentation and construction support for a private wastewater pump station and 460 metres of pressure main as part of playground upgrade works in the Bibra Lake Reserve.